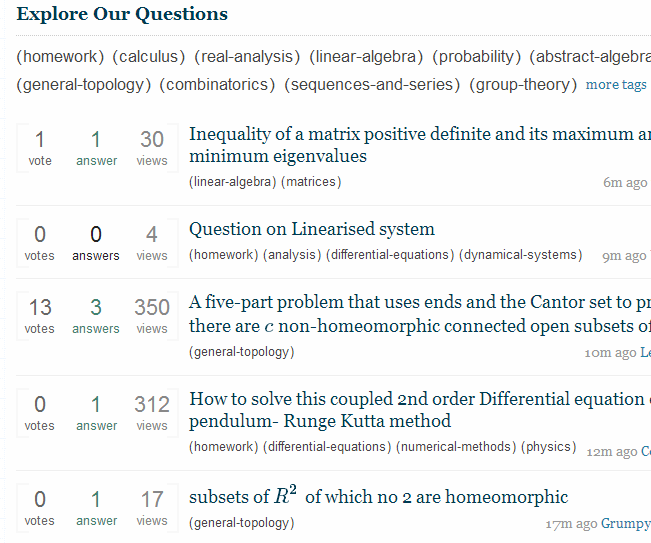 The front page of math.stackexchange, for unregistered users, shows the most widely viewed questions rather than the latest questions. Can the default front page format for unregistered users be changed? For a site to convey the dynamic ever-changing types of questions it gets, I think it would be better to let a new user see the latest questions being asked as the front page. The most widely viewed questions are somewhat stable (e.g., lately a "Sum of Some" and "Math is Tautology" questions are what an unregistered user sees on the front page at first) and this doesn't really put the best face on what math.stackexchange is about. A widely viewed question can be a somewhat low-quality question. Of course a new question can be low-quality too, but the new questions are often changing so there's a good chance that a front page of the latest questions will show better questions than one that has the most widely viewed questions. Note: If you can't duplicate what I am describing as the front page, make sure to log out of math.stackexchange and then look at the site. My browser is set to clear cookies any time I log out, so I always see math.stackexchange at first as an unregistered user. If you don't clear cookies you may always be logged in to this site and thus not see what I am describing as the unregistered user's front page. The answer below describes the frontpage for non-logged in users as it was from mid-April to late June 2013. 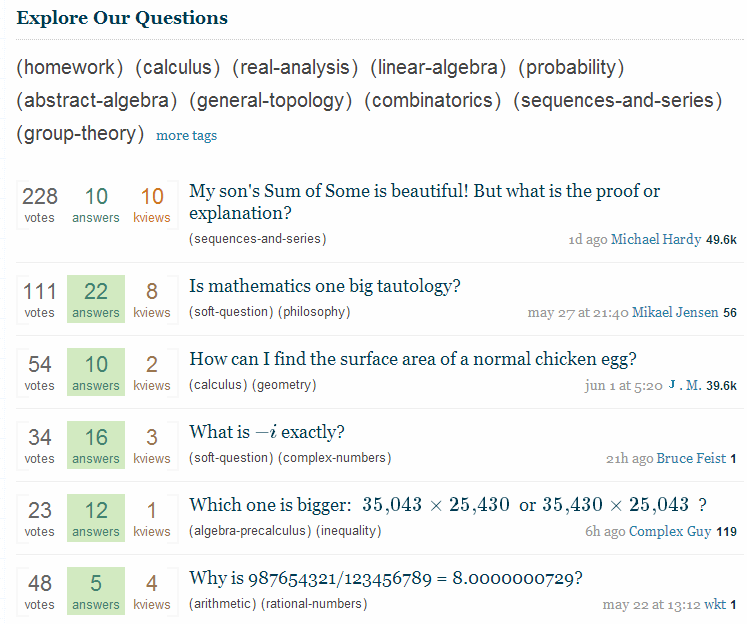 The current state of the page is different: it is similar, though not identical, to the active question list shown to logged in users (see below). It seems that the SE team realized and corrected their mistake. What do they see? Almost the same list of questions that logged-in users see when clicking month on the front page: questions with the most views, answers, and votes this month. The only difference is that closed questions are not shown. The list is preceded by most popular tags, set in annoyingly large font. I included a screenshot at the end of my answer. When did this change happen? Hard to tell because it was never mentioned in the meta.SO thread Recent feature changes to Stack Exchange. But I think it was in April 2013, after the introduction of new banner for non-logged-in users. Here is a screenshot of Physics site with the banner, but with the normal front page. Why do these questions have the most views, answers, and votes? Because at some point they drew attention of users of other SE sites, either through hot questions feature of the Multi-Collider™ in the upper-left corner of the screen, or by being mentioned outside of SE. Since the rest of SE network is many times larger than Math.SE, it is quite likely that the most-viewed (-voted, -answered) questions will usually be questions of the kind that people outside of Math.SE find interesting. Note that many of them had to be protected from worthless answers by passers-by. Is this a problem? I think yes. If I did not know Math.SE better, the impression I would get from the screenshot below is that of a decaying math site akin to later days of sci.math. The front page filled with vague or discussion-y questions that are primarily voted up by passers-by is neither an accurate representation of Math.SE nor a good advertisement for it. What can we do? Ask SE to revert this change. An exception already exists: StackOverflow does not show the Month view to non-logged-in users. Related recent Meta.SO threads: The frontpage for anonymous users is too static and The association bonus should not enable users to vote on every site. I interpret the boldface part as there being some possibility to customize the first page for unregistered users. Given that the "Sum of Some"-question is still showing up, we should definitely change something. I'm not sure I would have ever joined MSE if I would have considered the current page representative. Not the answer you're looking for? Browse other questions tagged feature-request frontpage . Can we only ask practical questions at MSE?